We will happily push ourselves through gut-wrenching weight-training workouts, but the thought of cardio sends many scurrying for cover like cockroaches in a lit room. Most cardio is about as fun as watching clothes dry and – more importantly – we’re often told that cardio can cause muscle loss. This has led many people to suggest completely abolishing cardio from the weight-trainer’s arsenal. For an ectomorphic bodybuilder in the off-season, that is probably realistic and in many cases, advisable. But in the case of people with slower metabolisms, this may not be as feasible. So how can we properly implement cardio without it killing your gains? The practice of combining resistance training with cardio is scientifically termed as “concurrent training.” While concurrent training has been shown to be superior to endurance training alone for enhancing muscle mass and strength (duh), it has been shown to significantly hamper optimal strength and hypertrophy when compared with resistance training alone. Several studies have demonstrated that optimal gains in muscle mass and strength are obtained by strength training alone, compared with combining strength training and endurance training.1 However, a review of the scientific literature on concurrent training – conducted by Dr. Jacob Wilson of the University of Tampa and several of his colleagues – identified some interesting variables that can affect the way cardio training affects your strength, hypertrophy and body composition responses to resistance training. The first variable that was examined was the modality of cardio training. That is, did the type of cardio performed actually make a difference in strength and hypertrophy responses to training? What Dr. Wilson found may shock you. The type of cardio performed made a HUGE difference in terms of proper strength and hypertrophy development in response to resistance training. Endurance running or walking caused significantly more decrement in the development of optimal hypertrophy compared with cycling.1 This is also in accordance with a study that compared cycling with incline walking on a treadmill, and found that cycling was significantly better for achieving hypertrophy when combined with resistance training.2 The researchers concluded that the differences observed here were likely due to the fact cycling requires more hip flexion and multi-joint activation of muscles involved in exercises like squats and leg presses— compared with endurance running and walking, which are not movements similar to any leg exercises that produce muscular hypertrophy. The above analysis concluded that the effects of cardio on strength and hypertrophy are “body part specific.” That is, lower body cardio did not have negative effects on hypertrophy and strength development of upper body parts. Additionally, it has been demonstrated that rowers who added high-intensity resistance training (with rows) to their protocol had similar strength and hypertrophy gains compared with a group of non-rowers who followed the same resistance training protocol.3 Therefore, in terms of the best types of cardio, it appears that one should use cardio equipment that most closely mimics movements performed during resistance training. Also, while long distance running and walking result in strength and hypertrophy decrements, sprinting does not— most likely due to the fact that sprinting requires significant hip flexion and is more similar to multi-joint leg exercises. The other major variables the researchers examined were the intensity and duration of cardio work, and how it affects strength and hypertrophy when combined with resistance training. They essentially demonstrated that the longer the bout of cardio, the greater the impairment of strength and hypertrophy. Interestingly, they found that short, high-intensity bouts of cardio like repeated sprinting had no negative impact on strength and hypertrophy development. This is most likely due to the increased hip flexion, as discussed above, and because high-intensity sprinting or cycling causes your muscles to make high-velocity contractions— activating fast-twitch muscle fibers. Endurance cardio, on the other hand, will most likely not activate the large, fast-twitch muscle fibers. Now, I know some of the “broscientists” out there will pout and stomp their feet – claiming that high-intensity cardio causes muscle loss. Since these guys don’t like real science, I’ll keep it simple for them. Go down to a track meet and check out the legs on a sprinter, and then check out the legs on an endurance runner or power walker – and tell me which type of cardio is better for optimizing muscle. So while the broscientists slave away walking their hard-earned gains off for hours on a treadmill, I’ll be doing high-intensity sprinting or cycling, building more muscle! Gergley JC. Comparison of two lower-body modes of endurance training on lower-body strength development while concurrently training. J Strength Cond Res 2009; (3):979-87. Bell GJ, Petersen SR, et al. Physiological adaptations to concurrent endurance training and low velocity resistance training. Int J Sports Med 1991;12: 384-390. Dr. Layne Norton is a natural pro bodybuilder with a Ph.D. in Nutritional Sciences. He offers contest prep, nutritional and training consultations through his company, BioLayne LLC. He also recently re-released his acclaimed DVD: “Layne Norton Unleashed.” To learn more about Layne, the services he offers, and his DVD, visit www.biolayne.com. 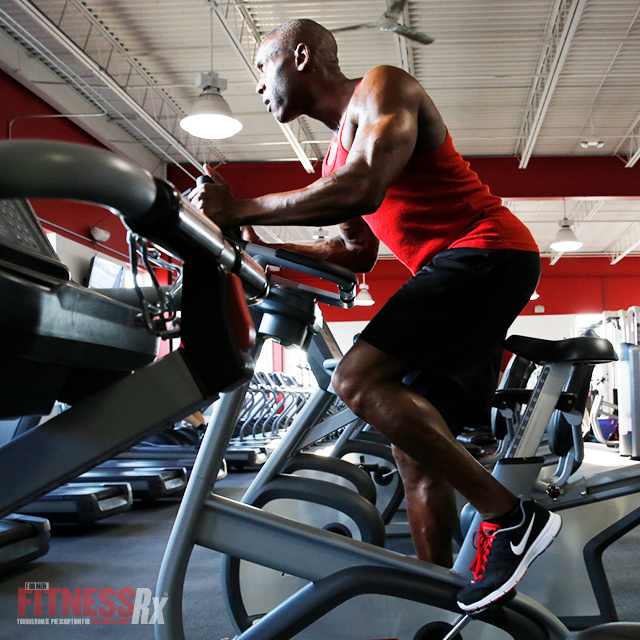 You’re Doing HIIT Cardio Wrong!